A spellbinding story of love, hope, and a child's innocent Christmas dreams. When Savannah Ivey agrees to teach photography to a group of at-risk children, she doesn't expect a sweet-spirited little crippled girl to steal her heart and become an important part of her family. Even Rags, the kleptomaniac cat, is captivated by the child named Marissa. When she goes missing, everyone, including Rags, experiences the pain of loss. Detective Craig Sledge fears that Marissa's unscrupulous, non-custodial father may be behind her disappearance and the search escalates into high gear. When even a pack of rescue dogs can't find the child, the detective turns to Rags and everyone prays for a Christmas miracle. Can Rags succeed where the others have failed? While this story involves some intense drama, it will also make you smile and even laugh out loud. Bring out the tissues for the beautiful ending. A Picture-Purrfect Christmas is one of those feel-good holiday stories you'll want to read over and over again. The Kindle version of A Picture Purrfect Christmas is available now for only $2.99 at Amazon. A Picture Purrfect Christmas is also available now in Paperback at Amazon. 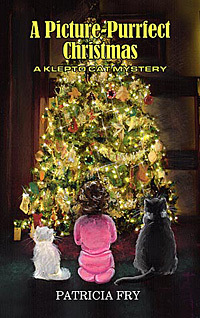 A Picture Purrfect Christmas paperback is available in the Matilija Press store.